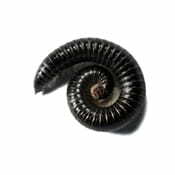 Millipedes range from 2 to 280 millimeters (0.079 to 11.0 in) in length, and can have as few as eleven, to over a hundred segments. They are generally black or brown in color, although there are few brightly colored species. The millipede’s most obvious feature is its large number of legs. In fact, its name is a compound word formed from the Latin roots milli (“thousand”) and ped (“foot”). Despite their name, these creatures do not have a thousand legs, although the rare species Illacme plenipes have up to 750. However, common species have between 36 and 400 legs. Having very many short legs makes millipedes rather slow, but they are powerful burrowers. With their legs and body length moving in a wavelike pattern, they easily force their way underground head first. They also seem to have some engineering ability, reinforcing the tunnel by rearranging the particles around it.Their bodies have segmented sections which make them move in a wave-like form. The head of millipedes has typically rounded above and flattened below and bears large mandibles. The body is flattened or cylindrical, with a single chitinous plate above, one at each side, and two or three on the underside. In many millipedes, these plates are fused to varying degrees, sometimes forming a single cylindrical ring. The plates are typically hard, being impregnated with calcium salts. Millipedes are detritivores and slow moving. Most millipedes eat decaying leaves and other dead plant matter, moisturizing the food with secretions and then scraping it in with the jaws. However, they can also be a minor garden pest, especially in greenhouses where they can cause severe damage to emergent seedlings. Signs of millipede damage include the stripping of the outer layers of a young plant stem and irregular damage to leaves and plant apices.